Thanks for stopping by! NJOY declared bankruptcy in September 2016. As a result, I’m not recommending this brand presently. If you’re looking for a great e-liquid, take a look at Black Note instead. I wouldn’t be surprised to learn that craft e-liquid is among the fastest growing segments of the e-cigarette industry. An e-cigarette company can sell you a device just once — maybe an upgrade or two down the line, if they’re lucky. E-liquid, though, can be sold to e-cigarette users indefinitely. It’s a far more crucial source of revenue. With e-smokers demanding lower and lower prices for one-flavor e-liquids, that revenue has begun to decline. While e-smokers have shown themselves less willing to pay top dollar for an e-liquid with just one flavor, small batch e-liquids with unique flavor blends continue to command high prices. So, what should you do if you’re an e-cigarette company looking for a share in the craft e-liquid market? Get in on the action, of course! On the surface, the NJOY Artist Collection might look a bit like a “me too” product. However, its quality is actually outstanding. 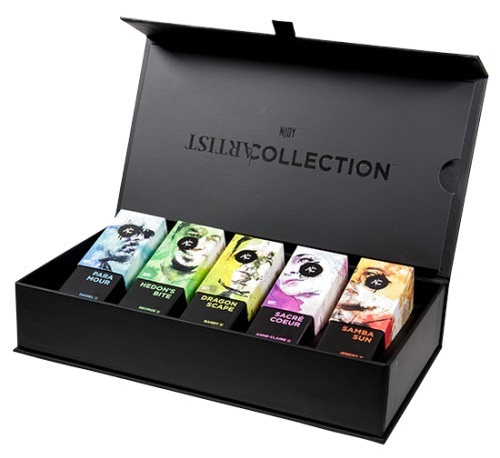 The NJOY Artist Collection features some of the most interesting and subtle blends I’ve ever tasted. In fact, although I typically don’t buy sweet e-liquids at all, I have re-purchased some items in the NJOY Artist Collection more than once since my initial review sample ran out. That’s how good these e-liquids are. View the NJOY Artist Collection at the NJOY website. The Artist Collection costs $22.99 per bottle or $114.99 for the full set. All orders from NJOY ship free, but no coupon codes may be used in conjunction with e-liquid purchases. To develop the Artist Collection, NJOY collaborated with some e-liquid makers with whom you might be familiar: P.O.E.T., Vaponaute, Mr. Goodvape, Flavorz and Good Life Vapor. Each person is portrayed as an artisan, complete with his or her own watercolor portrait on the box. The packaging makes a great impression; the clear glass bottles are very nice, and the outer boxes do a good job of both protecting the product and describing the e-liquid and the person who created it. The five blends feature different VG/PG blends according to the desires of their creators, and according to testing by Enthalpy Analytical, the e-liquids do not have detectable levels of diacetyl or acetyl propionyl. I’ll go into a bit more detail as my NJOY Artist Collection review continues, but to summarize my opinion, the Artist Collection is the best lineup of sweet e-liquids I’ve ever reviewed. Where e-liquid is concerned, I’ve never really needed variety. I’ll happily test whatever is sent to me, and as a result I’ve tried at least 300 e-liquids in the time that I’ve reviewed e-cigarettes — I lost count long ago. However, only a couple of times have I ever re-purchased anything that wasn’t my primary flavor at the time. I received my initial review supply of the NJOY Artist Collection just a couple of months ago, and I’ve already re-purchased my favorite flavors twice — something I’ve never done before with sweet e-liquids. I guess my primary problem with most sweet e-liquids is the fact that they lack any kind of subtlety. Many of them are certainly tasty, but I couldn’t imagine wanting to vape something like butterscotch, cherry or vanilla all day. Tasting the same sweet flavor on my tongue all day really gets old quickly. That’s why I prefer neutral flavors that go with everything. However, the NJOY Artist Collection has really changed my mind about what a skilled artist can do with a blend of sweet flavors. By blending sweet flavors with spicy or savory notes, NJOY has managed to develop sweet e-liquids that I can vape all day without complaint. 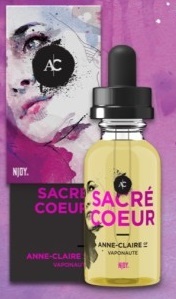 I’d like to draw attention at this point to Sacre Coeur, my favorite e-liquid in the NJOY Artist Collection. Created by Anne-Claire of Vaponaute, this e-liquid blends the flavors of rhubarb, custard, almond torte and bourbon. If you’ve ever had an e-liquid that used bourbon as a flavor note, you know that an e-liquid with this flavor often comes with an alcohol-like aftertaste. That’s not surprising, of course, but somehow Sacre Coeur completely avoids the alcohol flavor and contains just the interesting savory complexity of bourbon. The bourbon flavor balances the sweet flavors so wonderfully that you can’t help but want more. Samba Sun and Paramour are nearly as nice. Samba Sun — primarily featuring the flavors of citrus and marshmallow — is probably the sweetest flavor in the NJOY Artist Collection. Somehow, though, the sweet citrus flavor is done so well that it never becomes cloying. Paramour blends fruit and spice, tasting mainly of pear, vanilla and cinnamon. In other words, it tastes like a pear crumble topped with ice cream — delicious! As I write this, fall is ending and winter is closing in, and Paramour feels like the perfect seasonal e-liquid. I found Dragonscape to be the least interesting e-liquid in the NJOY Artist Collection. While it was definitely good, I found the coffee flavor very similar to e-liquids I’ve tasted in the past, so nothing about this e-liquid really stuck out for me. I also wasn’t terribly fond of Hedon’s Bite. Although I like melons, I tend not to like melon flavors and felt that the melon flavor overpowered this e-liquid. Some writers have called Hedon’s Bite the best of the bunch, though; if you do like melon flavors, I suspect that you’ll really enjoy this e-liquid. Until the release of the Artist Collection, I had always considered NJOY an e-cigarette company primarily for beginners. With products like the NJOY King (Review) headlining the lineup, there didn’t seem to be a lot of reasons for experienced e-smokers to give NJOY a second look. The NJOY Artist Collection changes all of that by giving the experienced vaping community exactly what they’re looking for: creative, subtle blended e-liquids at a fair price. If you already prefer sweeter e-liquids, the NJOY Artist Collection is going to be a dream come true. Although the top notes of the e-liquids do tend to be quite sweet, they’re balanced by savory, creamy or spicy bottom notes that’ll make you crave more. Although I’ve enjoyed plenty of sweet e-liquids in the past, my favorite flavors in the Artist Collection are the only sweet e-liquids I’ve ever loved. I’m fairly certain that I have a bottle of Sacre Coeur waiting in my mailbox, in fact, and I can’t wait to retrieve it. Thank You so much for the very informative reviews, suggestions, and hard work you have put into this. I have been vaping for 5 years and still trying to take in all the info I can get. Your website is very user friendly and you are very Beautiful. I still got alot more info I am interested in and you have it all on your website. Thanks for reading, Wade! I’ve been writing here for a long time, and I’ve done my best to make things easy to find.